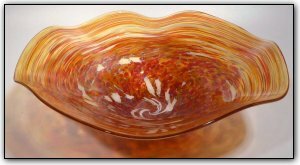 This lovely table bowl features deep and rich gold topaz and red, and also has real gold adventurine added for a real gold sparkle. This symmetrical bowl sits upon a pedestal, but also can sit nicely on its side as shown in several of the pictures. Make sure to zoom in to see just how deep and luscious the various shades of are, and the more light you shine on this piece... the more it will sparkle!